Many generations of American schoolchildren were taught that Columbus discovered America, and a holiday reminds us every October. But historical investigation in recent years has shown us otherwise. There is evidence that adventurers, explorers, traders, and nomads from various parts of the globe set foot on American soil long before 1492. And expeditions that landed in the Americas reported people already living there—indicating that America had been “discovered” before. 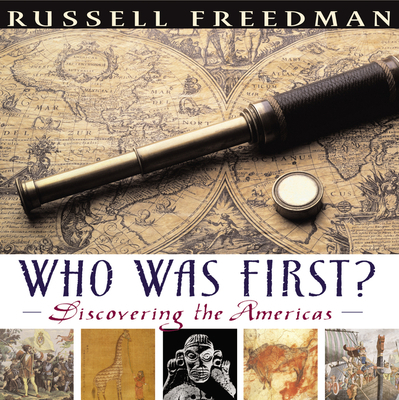 Russell Freedman brings his legendary skills as researcher and storyteller to this fresh and intriguing look at the American past. Colorful legends and first-person accounts are woven into the riveting narrative, which also illuminates the way historians and mapmakers have gathered, evaluated, and recorded information throughout the ages. Students will discover fascinating information as well as a fine example of the research process in this thought-provoking work. Freedman provides an intriguing, fresh, and compelling view of traditional American history, taking readers beyond the familiar story of Columbus as the 'discoverer of America' and presenting new theories and possiblitites about who might have come to the Americas first and why. A variety of illustrations from maps and models to dioramas and paintings embellish the text; a bibliography, index, and specific sources for quotations are also included.